Welcome to Will's Retro SFX Pack, Volume 2! Here are 70 MORE super retro sounds, including environment sounds, using items, fire igniting, falling, crashing, and more! Need some 8-bit bird tweets or chiptune splash sounds? Gotcha covered! 6 chiptune bird sounds. Add a little wildlife to your game! 5 "crash" sounds. When heavy objects fall, they hit hard. 5 falling sounds. Suitable for characters, enemies, and more! 6 "fire ignite" sounds. Good for different attacks, abilities, or spells. 10 item sounds. Find the sound that's right for your RPG item! 5 chiptune scream sounds. They're more like ghostly wails, really. 5 splash sounds. Even pixel water makes a splash. 6 wave sounds. Tide comes in, tide goes out. 5 UI sounds. Make your buttons feel responsive with a bit of sound. 5 warp sounds. Because you can never have enough sci-fi sound effects! 7 surprise miscellaneous sounds! What could they be...? 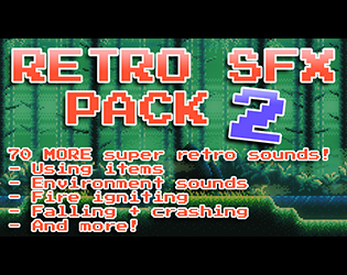 Retro SFX Pack is the first installment of retro sound effects! It has a wide variety of generic chiptune sound effects that fit with most games, such as jump sounds, coin sounds, and powerup sounds. Head on over and check it out!